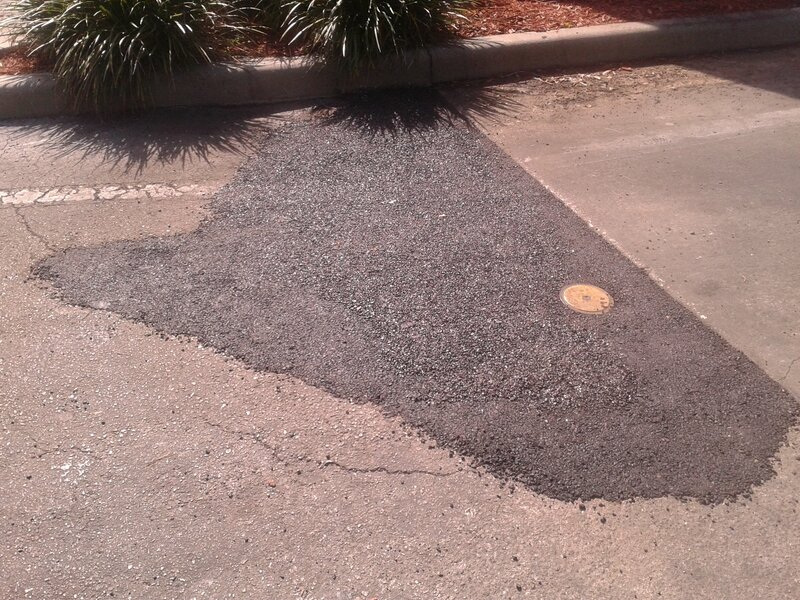 Asphalt repair by Bobby’s Handyman Service . Now that’s a nice asphalt repair ! In this post I will teach you how to Install a toilet. Step 1 shut off the water supply to the toilet. 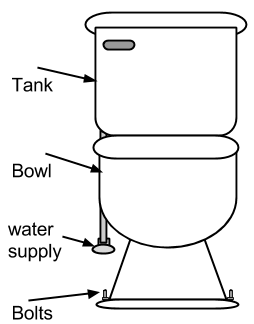 You can find the water supply usually coming out of the wall at the base of the toilet on the left hand side of the toilet (see diagram). Step 2 Flush the toilet and try to remove as much water as possible from the toilet bowl. Some times I use a small cup or container to scoop out the water. This will minimize the water that can potentially get on the floor when you install a toilet. Step 3″Very important” Before continuing make sure that the water supply has been shut off and that there is no water going into the tank. In some cases the the shut off valve (AKA speedy valve) is defective and the water continues to flow into the tank. If this is the case stop here and view my post how to shut off the water supply to the entire house. If you are sure that the water is off continue to step 4. Step 4 Prepare the place you will set the old toilet once it is removed – This step is optional for installing a toilet near a tub – Place apiece of a cardboard box inside the bathtub. This will protect your tub from getting scratched later on in the process. If for any reason you can not place the toilet in the tub you should prepare the floor in advance to prevent any water damage. You can maybe use a cardboard box with an old shower curtain over it to prevent any water damage to the floor. Step 5 There is a hose (AKA speedy hose or supply line) that connects the toilet to the water supply. Disconnect the bottom fitting of the hose that is connected to the shut off valve. You should keep a small bucket and a few rags within reach to catch any excess water in the line. Step 6 remove the bolts located on both sides of the toilet base. 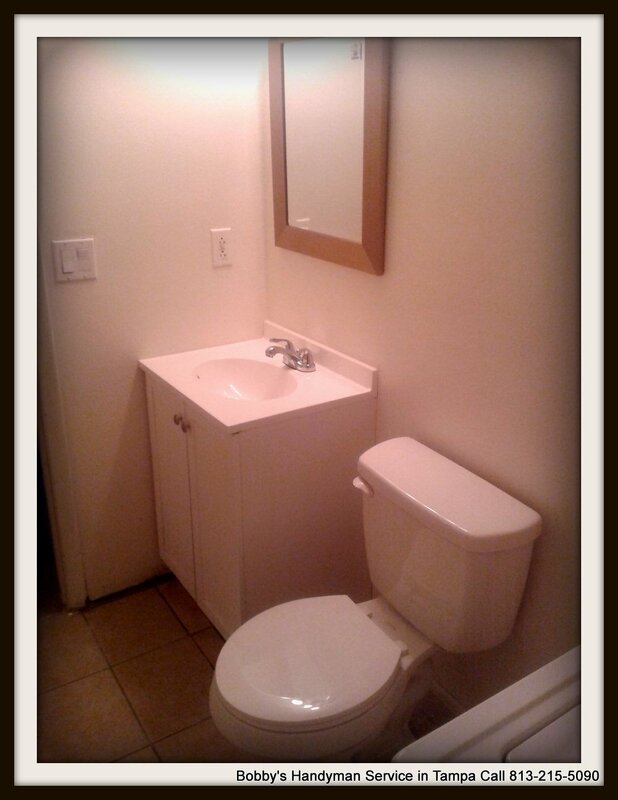 A simple inexpensive bathroom renovation in Tampa Florida for less than $150 bucks. Regardless if your an investor looking to flip a house for a quick profit or if you just want to rent your property to create a steady stream of income. One of the easiest ways to make your property more appealing to the consumer is by renovating the bathroom. Sometimes as an investor you may come across properties that are in fair condition but the bathrooms are either outdated or dingy, dirty and smelly. Many investors, regularly run into properties with bathrooms in these conditions and get discouraged and decide not purchase them . Personally I try to encourage the purchase of these types of property. As an example I will describe this simple bathroom renovation that made the difference of 40 thousand dollars in the sale price and resulted in a $30 thousand dollar profit for the investor. This property was purchased way below market value because it needed some minor repairs. Most of the work was cosmetic and very inexpensive. I believe all the work was done for under $8,000 which included all the labor and material. Another way to save money when investing in property is to actually get your hands dirty! You can save tons of money buy just doing some of the work from your bathroom renovation yourself . For example, to install a toilet hiring a plumber can be very expensive. But do you know how easy it actually is to put a toilet in ? It is so easy all you have to do is turn off the water supply loosen two bolts and lift the toilet out of place and replace it. Anyone with half a brain can do this, all you have to do is carefully follow instructions. For easy instructions just read my post on how to install a toilet.